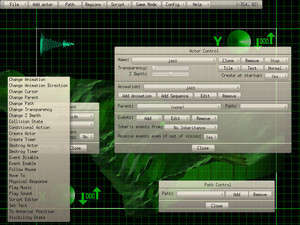 Game Editor is an interactive multimedia tool for game development, with a simple interface and a rich set of features. The software allows anyone to develop 2D games for personal computers and mobile devices! The tool is designed to be portable across many different platforms, including Windows (9x, Me, NT, 2000, 2003, XP, Vista), Pocket PC, Handheld PC, GP2X, Windows Mobile-based Smartphones and Linux. For security reasons, you should also check out the Game Editor download at LO4D.com which includes virus and malware tests. Additional screenshots of this application download may be available, too. Game Editor has a presence on social networks. Game Editor download been highly rated by our users.